Ever wondered how Morbid Angel would sound if they were meaner and played blackened death metal? Well, wonder no longer! Apparently, the band in question is a supergroup, and not only that, but also a rather impressive one — at least on paper. “Something Wicked Marches In” is their début album, but really the band has existed since 2015, and given that their music is right up my alley, it feels off that this record is the first time that I’ve heard about them. The constellation includes David Vincent of Morbid Angel fame on bass guitar and the familiar harsh vocals, Flo Mounier of Cryptopsy delivering the blastbeats (of which there are plenty here) and Rune ‘Blasphemer’ Eriksen of the notorious Mayhem on guitar. 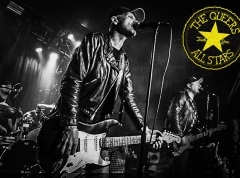 The thing about supergroups, at least in my experience, is that they sometimes have a hard time mixing the different styles each member is revered for. Either they incorporate each individual sound perfectly and release an absolute killer of an album, or they fall short of their own brilliance and quickly disappear into the void of oblivion. Hopefully thus, VLTIMAS was going to deliver an album worth remembering, as this trio definitely has the potential to accomplish something truly magnificent. 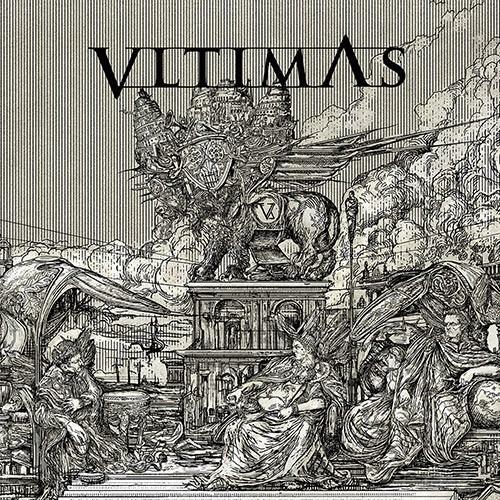 VLTIMAS wastes little time, with the title track opening with an aggressive take on a marching tune, before Vincent chimes in with his instantly recognizable deep and harsh voice. This track is an absolute banger and has so much to offer; both the drum patterns and riffs are from the top shelf and keep the listener hooked right from the first chord, which is a general theme throughout the release. The sheer aggressive nature of the bands the three members are known for is omnipresent and fans of both black and death metal should find plenty to be excited about in this collection of songs. But it’s of course not all just about sounding as brutal and aggressive as possible. The second track, “Praevalidus”, consists of those elements, but it also mixes in some Satyricon-esque riffing around the chorus. It is at once enthralling and menacing, and when Vincent tunes his pipes down to yet another trademark of his voice, the deep, almost spoken word-style lyrics just add to the effect. Meanwhile, other tracks focus more on the brutality and truly heavy composition and tone of the drums and guitar. As its name suggests, “Total Destroy” is a true devastator of both ears and necks, and even though the origin of the guitar in it is more in the vein of black metal, many of the riffs in it actually resemble the older Morbid Angel sound, further emphasising the impressive nature of this record. On album highlight “Monolith”, VLTIMAS showcase how to write a track which is not only about metal. After getting things started with breaking some necks, the track quickly switches to a ‘mellower’ tempo, and as it progresses, the band starts to incorporate some clever atmospheric elements and couples those with well-structured breakdowns and heavier touches to make the really brutal parts stand out more. And at this point, it is hard to argue with the fact that this is a pure death metal masterclass I’m listening to, complemented well by the epic artwork, which simply begs for you to own the vinyl and put it on display. I could probably continue rambling on about every single song present on this release, as they all have something of their own to offer. But instead, I would like to talk more generally about the album. Put simply, it is good. No, actually really good! Even the tracks not highlighted here stand out amongst your usual releases in the metal genre and are far beyond what most other bands have managed to conjure up so far this year. I know all three musicians have plenty of writing experience through their many years of being active on the metal stage, but as mentioned in the first paragraph, I still find it very impressive that VLTIMAS have managed to pull off such an evil-sounding and well-composed début. It offers 40 minutes of full force and sheer aggression whilst still managing to stay true to the origins of all three members. The compositions are all so much more than just death and black metal, catering to all senses of the listener. The album not only contains the brutality necessary for an album of this genre, but also flirts with progressive song structures and even some atmospheric elements that ensure the listener is left wanting more once it clocks out. Almost every track is different from the other, which makes this a refreshing take on the extreme metal genre, and a definite roundhouse kick to your face disguised in a fresh and modern, yet still organic sound. Sometimes it goes to show that you only need a seasoned pack of wolves to show the youngsters how to write a contender for album of the year, whilst still managing to stay true to yourself in every aspect of the word. With VLTIMAS set to perform at this year’s Copenhell in June, summer cannot come fast enough, as I simply can’t wait to see how they will pull this off live.